MTA launched the project in the Bowling Green station, along subway lines 4 and 5, and, if successful, will expand the project to a total of five subway stations and commuter rail hubs in the upcoming weeks. The project is currently in a pilot phase and will remain that way for the next 180 days. 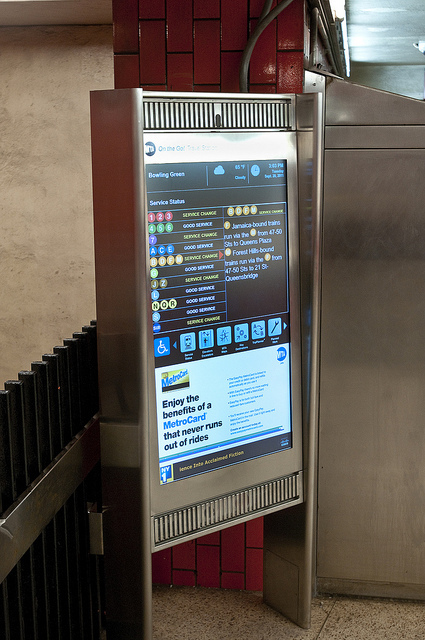 The kiosk is a sleek, stainless structure that holds a large screen. According to DownTownExpress, MTA did not have to place any upfront investments for the project. 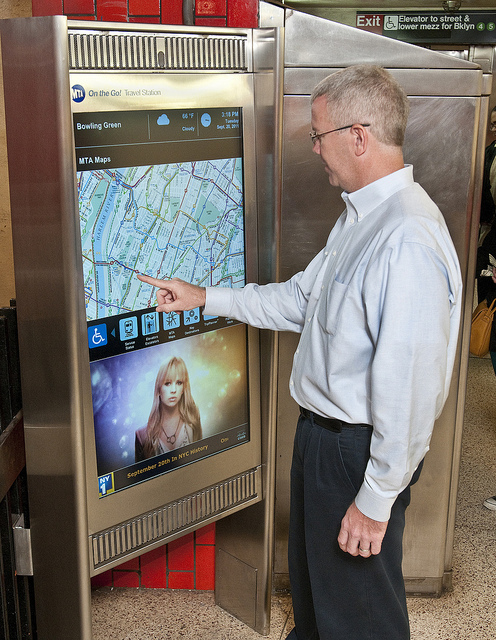 Cisco developed the travel station and is funding it through advertisements that will display on the kiosks. Though MTA was not responsible for footing the bill, it will pay for labor, explains Nick Judd of Tech President. Judd also brings up an interesting point while discussing the element of privacy in location-aware technology that is becoming more and more omnipresent in our daily lives. “These are some of the first real-world digital interventions that many people will see in their daily commutes, but theorists and thinkers have been chewing for some time on how they will change our lives as they become more ubiquitous,” Judd explains. He gives the example of New York City taxi cabs that now carry small screens that show advertisements to a captive audience—“a potentially lucrative opportunity,” Judd says. He also gives the example of vending machines in Japan that use facial recognition software that make inferences on your demographics and accordingly suggest beverages for you to buy. Judd does acknowledge that his concerns have more to do with “what might happen” rather than “what is,” yet his argument is still intriguing. Judd also touches on New York City’s recent efforts in replacing single-space parking meters with Muni-Meters that keep track of all on-street parking on a block. In a conversation with Adam Greenfield, founder of the urban design firm Urbanscale, Greenfield tells Judd about the implications of collecting and using this kind of data. “You’re beginning to pull information off of real people’s real use of the real city,” Greenfield says, all in order to cater services more specifically. Where do your thoughts lie on this issue? How much information is too much?